We welcome you to our traditional stone-built mountain home which has been carefully renovated to provide all modern amenities while at the same time preserving its authenticity and cosy, comfortable feel. Located in a small hamlet at an altitude of 1200m, it is just five minute drive from the picturesque market town of Chorges. The 35m2 cottage comprises a 17m2 open plan living/dining/kitchen area (opening out onto a private, south-facing 20m2 terrace), a double bedroom and a beautifully appointed bathroom with Italian-style shower. The modern, functional, fully-equipped kitchen has a convection oven with a gas and electric hob and extractor hood, a microwave, fridge freezer and Nespresso coffee machine. The lounge area (which includes the160 x 190cm sofa bed) has a 82cm LCD TV, DVD player and a selection of DVDs, Internet access, and a number of maps and hiking/mountain biking guidebooks and magazines. The bedroom contains two 90 x 190cm beds and has plenty of storage space. The washing machine is housed in the bathroom. If necessary, baby equipment (cot, high chair, changing mat) can be provided. In addition to the private terrace, where you will find a barbeque and comfortable garden furniture with a parasol, you can also enjoy the owners shady garden from where you will marvel at the view of the lake and the mountains. Along with my partner, I enjoy the nature, the mountain activities, the good food and the marvellous quality of life in this pollution-free area. We bought this 19th century house in 2008 and were attracted to it by its superb mountain location and views down over the Serre-Poncon Lake. We have renovated it with sensitivity to retain its original charm. This is a lovely apartment at the top of the hill overlooking Chorges. The neighbors are an international group. Everyone was so kind and helpful . Lots of suggestion and information for places to see and visit in the area. The apartment is very well equipped, perfect for 2 people. The terrace is a wonderful place to have morning coffee or evening cocktails or just spend time relaxing during the day! We spent a delightful week here. Nous sommes ravis de vous avoir donné satisfaction et avons apprécié nos échanges. Bon retour à SAN DIEGO. If you are looking for a quiet spot with great locations for lots of outdoor activities Chorges is very central. The property is clean and tidy, has lots of character and is very well equipped. Martine and Laadi are excellent hosts and very helpful (plus Laadi's English is excellent!). Our trip did not quite go to plan but the hospital in Gap is pretty good. We highly recommended this property. Thank you very much for your description of your stay in our property. We are delighted to see you again soon. My wife and I stayed with Laddie and Martine this summer and could not have had a better experience. The day we arrived we were invited into their home to visit with them and their neighbors over a bottle of wine and snacks (both were excellent). The cottage itself was wonderfully decorated and equipped with every convenience. The Chorges area is a perfecthome base for day trips into the Alps and there was plenty to see. Laddie and Martine were extremely helpful with local area information and we enjoyed every suggestion they gave us. 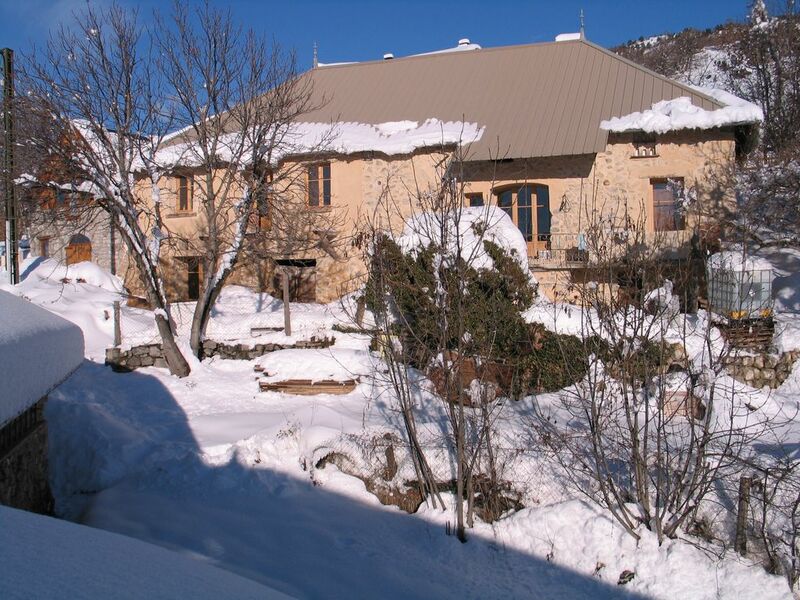 If you are looking for a wonderful place to stay and enjoy the French Alps look no further. We hope one day to return and spend more time at this wonderful cottage. Thank you for the compliments and we will welcome you again, if the opportunity presents itself in the best conditions. You say hello to our neighbors who were also much appreciated. Quel séjour ! Nous avons passé de merveilleuses vacances d’hiver grâce à l’accueil, l’hospitalité et les conseils avisés de Martine et Laadi ! Merci à eux ! Ce gîte est un bijoux dans un écrin ! Le soleil en prime ! L’emplacement est idéal pour profiter de la montagne, du lac de Serre-Ponçon et des nombreuses activités touristiques que la région propose. Nous le recommandons chaleureusement ! Merci beaucoup pour votre appréciation qui nous fait plaisir. Nous espérons vous recevoir à nouveau. Nous avons passé 10 merveilleux! Le gîte a un cachet fou! Super bien équipé , avec un petit plus au niveau de la décoration. Nous avons été très bien accueillis , simplement et chaleureusement. Le jardin et la foultitude de fleurs, ajoutent au charme de ce lieu si paisible! Et, bien sûr, la région autour...le lac turquoise, les montagnes, la roche..Un régal pour les yeux et….le cœur! Sehr schöne, kleine Wohnung mit allem was man braucht und super netten Vermietern!! !